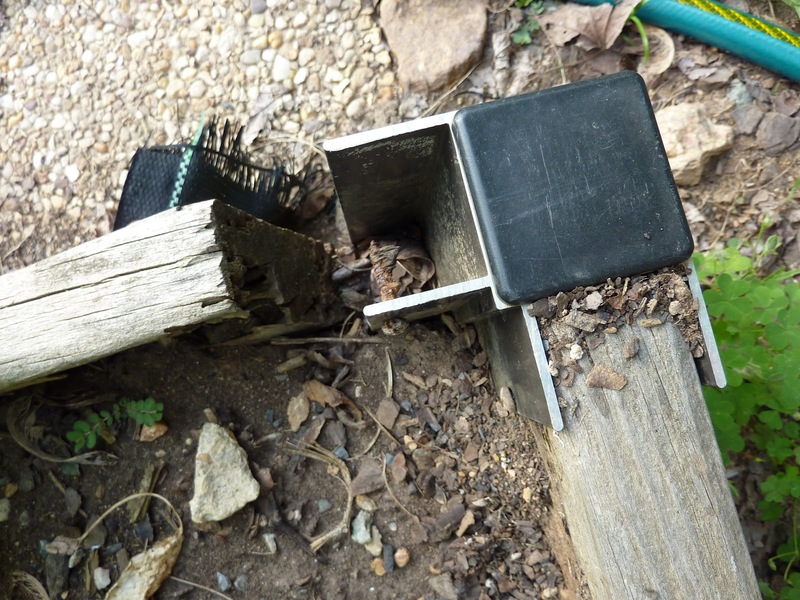 I wrote a post recently in my personal garden blog about how, as compared to the Derwood Demo Garden, my landscape of out-of-control weeds is like the Garden of Dorian Gray, except not so much stuck in a closet. The vegetable garden was a particularly shameful part of the general mess. I’ve done a little work on it since, but it’s still not something I’d show off. What can I say: my soil is fertile, and the weeds take advantage if I look away for too long. Now, there are some intellectual (and even horticultural) advantages to neglect. If you ever wanted to know what cutting celery looks like when it survives over the winter and goes to flower the next spring, here you are. We pulled out the celery plants in the demo garden ages ago; at home, not so much. Actually, since I have nothing else to go into the corner this is occupying, I just pruned back the branches lying across the bed, and left the rest. 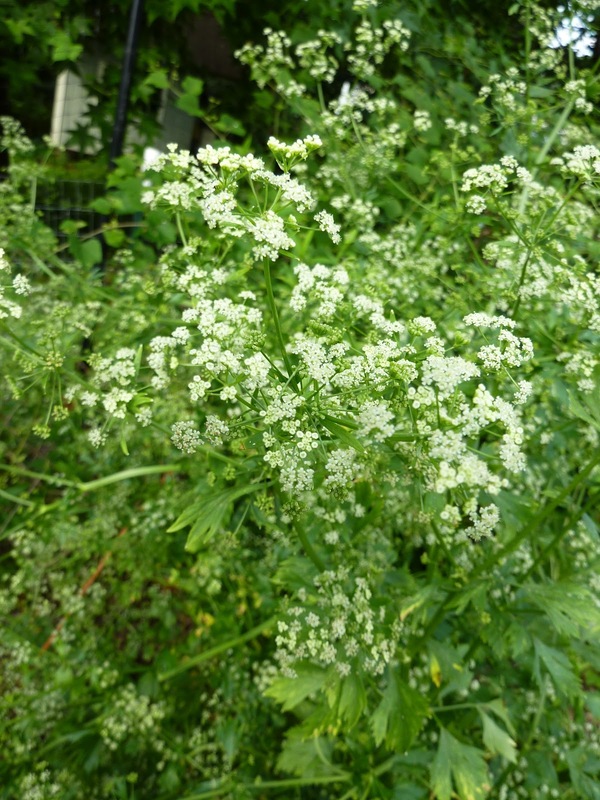 These umbelliferous flowers are great for attracting beneficial insects, like tiny parasitic wasps. General distraction and laziness isn’t the reason for making a decision about the garden now, however. I might reform. The first of the real reasons is that about half the garden is now in shade for a good part of the day (trees! Who knew they grew?). There are vegetables that will grow in part-shade, but dedicating beds to lettuce and half-strength leafy greens doesn’t help with a) crop rotation, and b) summer. The reason I need to decide this year is that my six- or seven-year-old raised beds, made of untreated pine coated with linseed oil, and metal corner pieces, are finally falling apart. (I usually advise people to go for untreated pine unless they are very sure they want the beds in that place forever. And frankly, plastic disintegrates eventually and cedar doesn’t last as long as it should given the price.) I should have replaced the beds before planting, obviously, but this gives me a season to make up my mind. So, what to do? We’ve put a lot of effort into the fence, but after expanding the garden three years ago I’ve never managed to develop the back half of it properly. I do have tomatoes in raised beds back there now, but they are a pain to get to with the black raspberries taking over the middle section of the garden. I’m fond of the trees that are casting shade on my vegetables. There’s nowhere else on our half acre where we can surround a sufficiently sunny area with a fence, and we very much need the fence. Perhaps the best solution will be to apply for a community garden plot for next year, and grow fruit in the fenced area (currants in the part-shade? ), after subduing the weeds. I’ll let you know what I decide. Anyone else facing decisions about edible garden plots due to changing conditions? I have the opposite scenario, having had a lot of trees taken down on the east- and south-facing slope of our land. We have much more sunshine, and I can definitely see the difference. Then the issue becomes, too MUCH sun, since we appear to be in alternating cycle of downpours or damp and showery for several days, and then very hot for several days. It's going to take time to figure this out and since I found out yesterday that NH is 14th in the list of states heating up due to climate change, I suspect we are in for a lot of vegetative changes over the next year. Things are growing gangbusters right now, especially tomatoes, peppers and eggplant in containers on the deck. It is very lush in NH right now, and I suspect we are close to making up the winter's precipitation deficit. There is also a big empty space because I never got around to planting chard. With the piles of it at the farmers markets, I'm finding it hard to regret right now. My groundhog seems to have been mostly frustrated by the fence. I used floppy deer netting up to about 3 1/2 feet and let the rest flop into the path way around the bed, then put down some card board stepping “stones”. It tangles my feet if I step off the cardboard, so I think the groundhog has turned back to the weeds and bushes which are growing so enthusiastically in the rest of the yard. If only it would eat oriental bittersweet.